It's an MP3 player that's sweet and sassy or all about cool chic. Mix the fashions, hair, and faces to match your mood! Looking for the perfect Barbie Girl? Be sure and check out our full selection of Barbie Girls and accessories at Amazon.com. The world seems a lot smaller these days thanks to connective technology such as MP3 players, cell phones, PDAs, the Internet, and more. So what better way for girls to go global than with this Barbie Girl device? Barbie has been at the forefront of trendsetting for nearly 50 years and now she's offering today's young girls a way to share their passion for fashion, music, and chat with their bffs. At barbiegirls.com girls can create their own, personalized online space&#151;everything from designing a "room" to creating a character&#151;where they can then play games, chat with gal pals, watch videos, and even shop with earned virtual money. Word filters, moderation tools, and other safety features ensure that the virtual world stays friendly and fun to all visitors, but the added security and benefits of this Barbie Girl device are ingenious. Create a look that's all your own -- from hair, eyes, and skin tone to clothing, accessories, and makeup. The Barbie Girl device is basically an MP3 player with attitude. First, it offers a range of customizable fashions and accessories, delivering the next generation of fashion doll play. Second, it is a music device with 512 MB of on-board memory (able to hold about 120 MP3 or 240 WMA-file songs). 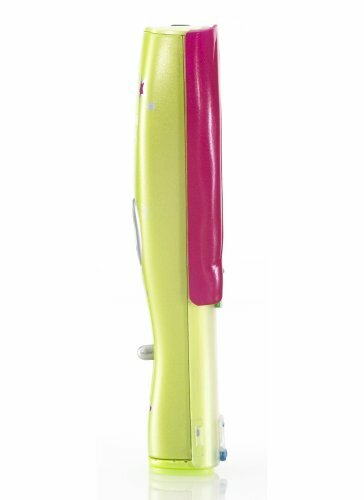 Third, the Barbie Girl device acts as a "key" for girls who have a room on barbiegirls.com. Girls who have this device and who have physically connected them into one another's computer docking stations can become "best friends" and chat in "secret." It adds a more personal touch to the site experience and an extra layer of safety for parents. The device comes with a secret code, as well, that once entered on the site can allow its user to unlock additional pets, games, hangouts, fashions, and more. To get additional secret codes, girls will have to buy more Barbie accessories, hunt them down on the Internet, or possibly ask their new online friends. Barbie Girl Green comes with two hairstyles, two faces, a skirt over leggings, a dress, a halter top, and two pairs of shoes that can be interchanged to match the owner's current mood and style. The tech gadget also includes adjustable earbuds, a belt clip, and a durable storage case so it's easy to take everywhere. Additional packs of fashions, pets, and accessories are sold separately and offer the ability for girls to make their Barbie Girl as unique as themselves. 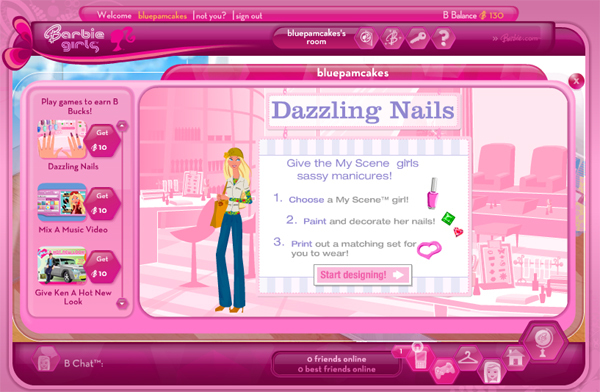 Dazzling Nails is one of three games you can play online to earn B bucks. The online world of Barbie Girls offers plenty of time killing fun and lets girls earn more B bucks to spend on virtual accessories. There are three games that can be played over and over, each one taking about 5 minutes to complete and rewarding players with 10 B bucks. Dazzling Nails lets you paint and decorate a set of nails (you can even select rings to go on the hand's fingers), and then allows you to print out the design so you can wear the nails, too. Mix a Music Video lets you choose one of five songs then add in an animated background, icon, and character to create a unique music video. Give Ken a New Look lets you makeover Barbie's boyfriend so she'll notice him again. There are plenty of outfits, cars, careers, and more to choose from for his new style. Barbie's world is chock full of places to visit and things to do. Also online is a small town filled with things for your Barbie Girl to do. There are boutiques, a pet store, and a furniture store to shop in. There's a salon for beauty tips and a caf¨¦ for a quick jolt of caffeine. There's even a movie theater where you can see trailers for upcoming movies -- and earn 20 B bucks for every one you watch. Or you can just stroll around the park and see what other Barbie Girls are up to. Whether it's an introduction to online communities or old hat to your 9-year-old, the Barbie Girls world is a friendly, fun, and safe place for girls to spend time. B Stylin, B In Tune, B Connected, with Barbie Girls! Connect her to your computer to unlock tons of new features on BarbieGirls.com, including special fashions, furniture, accessories, pets, and access to Club Beauty!